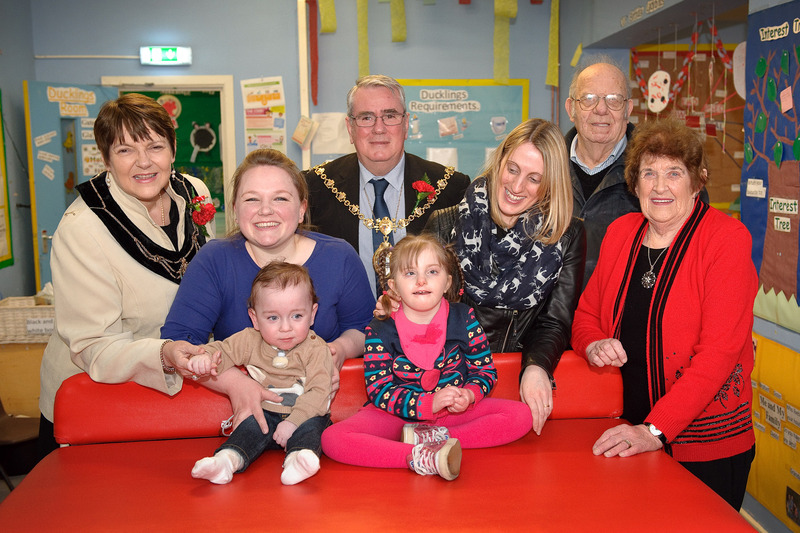 Parents Laura Waterhouse (second on the left) and Wendy Ebberll (second on the right) pictured with their children Benjamin and Eva, the Mayor and Mayoress of St Helens, and Marjorie and Arthur Hurst. A St Helens charity has donated a specialised changing table to a local nursery to cater for two young children with additional needs. The Helen Marie Friends charity – founded in 1985 by Arthur and Marjorie Hurst in memory of their daughter Helen Marie – donated the mobi changer to General Day Nursery in Sherdley Road following an application from Michelle Bamford an Advanced Practitioner for Autistic Spectrum Disorder at 5 Boroughs Partnership NHS Foundation Trust. Costing £2000, the mobi changer can be easily manoeuvred from room to room making it an extremely cost effective option for a multi-user environment. A presentation ceremony, attended by the Mayor and Mayoress of St Helens, Councillors Dave and Jeanette Banks, was held at the nursery last week as Arthur and Marjorie handed over the table to staff.